Bill Reid (1920-1998) was the great nephew of the Haida artist da.a.xiigang, Charles Edenshaw (1839-1920), and the grandson of the carver Charles Gladstone (1878-1954), who had himself been trained by Edenshaw. Reid grew up in Victoria, worked as a CBC announcer in Toronto and trained as a jeweller. He produced a number of modernist pieces in gold, turning to Haida-style carving and graphic design in the late 1950s after being inspired by a visit to Haida Gwaii. 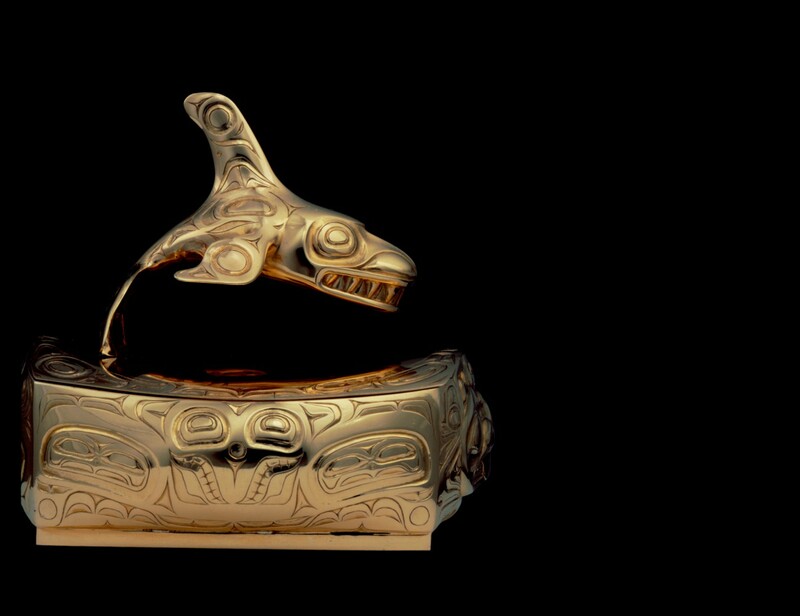 For this small gold box, made in 1971, he used jewellers’ techniques to render Haida forms drawn from traditional carving and formline designs. In the Royal BC Museum’s First Peoples gallery, this box is the only non-argillite work in the Haida Argillite exhibit. Its inclusion calls attention to Reid’s artistic debt to the Haida argillite carving tradition.